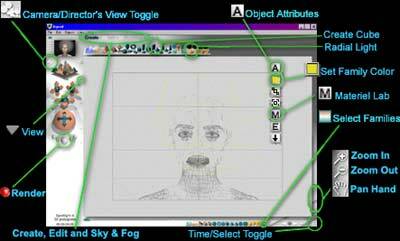 The Bryce 3D Interface and some of the buttons, palettes and editing tools. 1. Open Bryce and click: File > Document Setup (Ctrl+N). In the Document Set Up pop up menu select the standard button, 1:3.00 and 1920x1440 or higher. Check the "Constrain Proportions, AntiAlising and Superfine" settings. 2. Import .obj- Click: File > Import Object in pop up window find and select your Head.obj file. 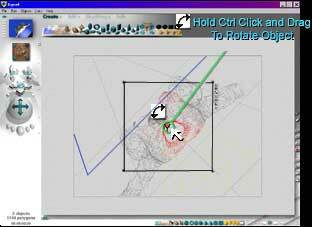 Holding down Ctrl+left click and drag to rotate objects. 4. Click the "View" arrow and select Camera View hold down Alt then click and drag to the right until the head is in the frame. 5. Hold Ctrl and click on the head object. In the pop up window select Head_3. •Tip: When moving objects, make sure you don't click and drag on one of the re-sizing handles. • Tip: Note that the "Texture Source Editor" button is pink. And the column select buttons are purple . 1. Open Material Lab- Click the "M" or (Ctrl+M) to open the "Material Lab"
1a. 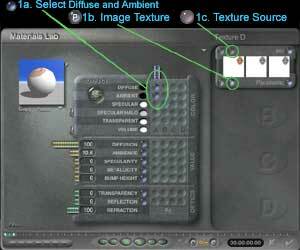 Select Diffuse and Ambient in the "A" column. 1b. Click the "Image Texture" button (the one with the "P" on it) and "Leo" will appear in the display window . 2a. For the first large window click "Load" In the pop up menu find and select your Face.psd. 2b. Next, in the first large window click "Copy"
2c. In the second large window click "Paste" and in the pop up menu select "Delete" Leave the third window as it is and click the finish check mark . In the Material Lab hit the finish check mark . 3. Hold down Ctrl+Shift and click on the right eye. 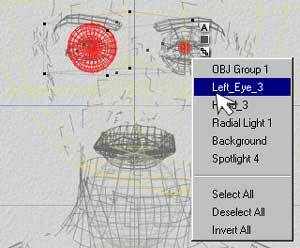 Select "Deselect All" Still holding down Ctrl+Shift, click the eye again and select (Right_Eye_1), (Right_Eye_2) and (Right_Eye_3) Then holding down Ctrl+Shift, click on the left eye and select (Left_Eye_1, 2 and 3) one at a time. These are the pulps, iris' and the whites of the eyes. It can be a little tricky selecting all of the eye parts 1, 2, and 3. Just keep holding down Ctrl+Shift and clicking until you have selected them all. 3a. Click "M" or (Ctrl+M) Select Button.jpg Diffuse and Button.jpg Ambient in the "A" column. 3b. Click the "Image Texture" button (the one with the "P" on it). 3c. Click the "Texture Source Editor" button. Click the next available small box in the first row. In the pop up window find and open your Eyes.psd file. 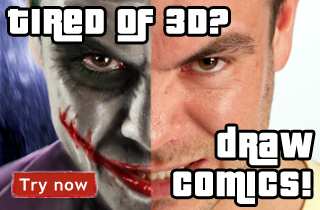 3d. Click "Copy" (bottom left) of the first large window and paste (bottom right) of the second large window. In the pop up click "Delete" and then the finish check mark . In the Material Lab hit the finish check mark . Repeat these steps for the eye lashes= (Head_7), lips= (Head_1), teeth= (Head_6) and any other parts you may be utilizing. Remember to select the "Next Empty" small window to load each new image. •Tip: As you are selecting individual objects it is a good practice to rename them in the "Objects Attributes" editor's "General" information tab. •Tip: You can also create a "Family" by clicking the "Edit Family" button directly underneath the "Objects Attributes" button. 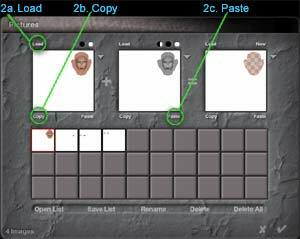 Doing this allows you to give individual or groups of objects a color and a name. This makes it possible to quickly select these designated groups of objects by clicking the "Time/Selection Palette Toggle" (on the lower right corner) then the "Select Families" button . This is extremely helpful when working with complex scenes with large quantities of objects. To add an object to a family: Click an object to select it then click the "Edit Family" button chose a color and type in a name for the family. Now you can select any other objects in your scene and click the "Edit Family" button and add it to one of your families by selecting the color of a family.